I had wanted to use this set for my Easter cards, but wanted another option besides the Blendabilities to "color" the image. Hmmmm. What to do. All of a sudden, I recalled that I had a little-used set, Work of Art (page 165), that may work nicely to add color to the image. 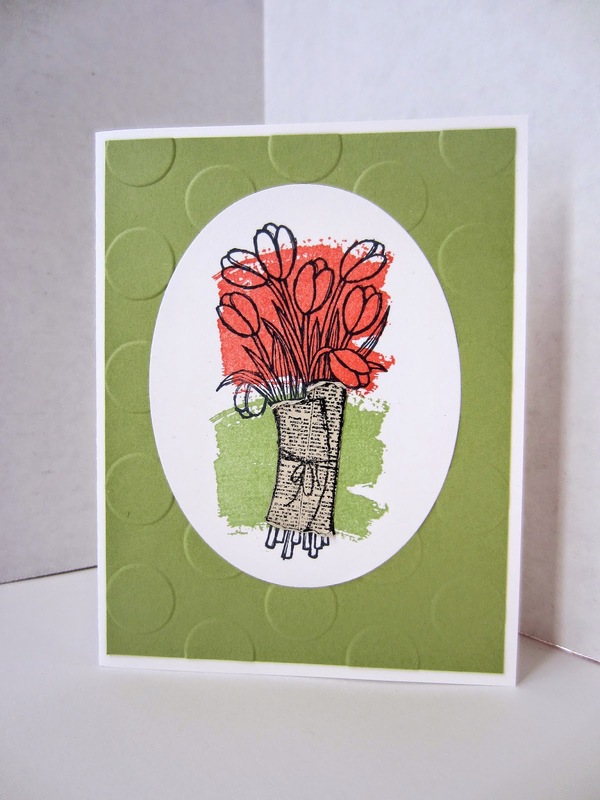 I stamped the watercolored "blob" in two different colors -- Calypso Coral and Pear Pizzazz -- on top of each other. 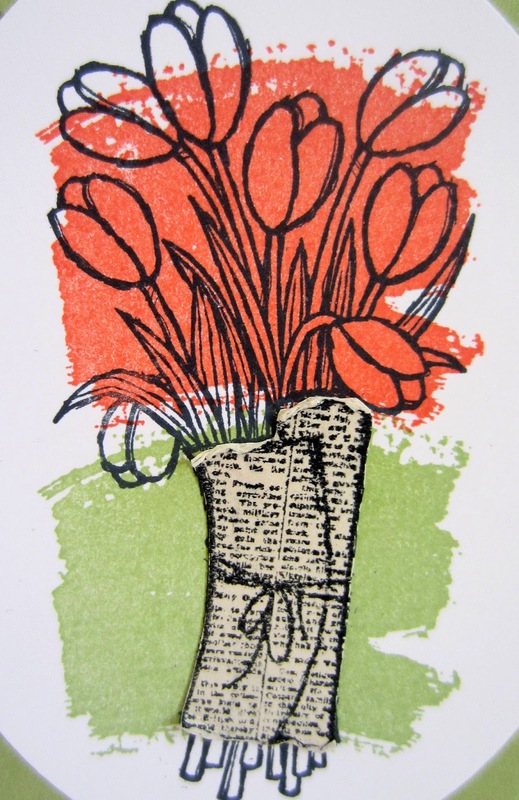 The intent was that the tulip flowers themselves would be the pinky-orangey color, while the leaves would be the appropriate green. 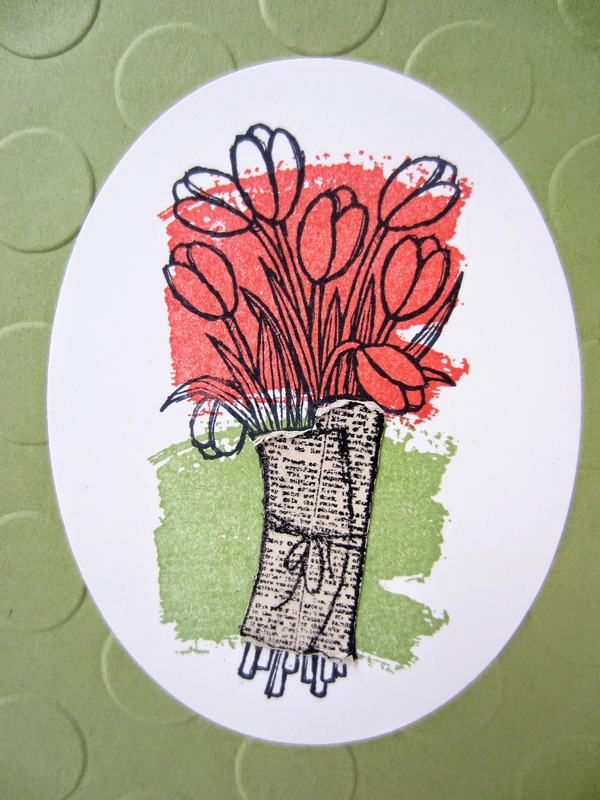 I stamped the tulips over these colorful areas in Black StazOn. While the final result was not exactly as I had envisioned it, I think it works quite well. Do you? As on the previous card using this set, I stamped the newspaper once again on Naturals Ivory, cut it out, and used my fingernail to pop the top and bottom edges out a bit for the 3-D look after it was glued in place. Since there are no words on the front of the card, it is possible that this little creation can work for any and all occasions that could arise. And, it's a fairly fast and easy card. With the help of my Big Shot, Framelits and Embossing Folders, it is a cinch to make several of them at one time. Have any of you used this stamp in other alternative ways? I like how you used the "watercolor blob". Lovely card! I love this card! It's simple, but I think that's the beauty of it. I especially like the touch of distressed ivory newsprint! Like you, I'm sad about the Blendabilities being discontinued. I can't speak for all your subscribers, but I would like to see you continue using them with cards you blog. I don't think it's any different than using retired DSP or other products, and clearly you love them. I'm open to seeing projects with anything you like to work with, retired or current, as your very best work happens when you're happy! When you use non-current products along with current stuff, not only do I get ideas on how to use up some of my stash, but I see even more potential in the newer products! Other people's art vision never ceases to impress me! Thanks for sharing at Thursday Favorite Things, hope to see you next week again! Happy Easter! I agree with Joyce. I love seeing what you've done with the blendies. I have them and was so sad when they were discontinued. Your card is great. I haven't used work of art but I think I will now! Keep doing what makes you happy!!! Oh my...so simple, but I love it! Gorgeous! Thanks for joining us at Idea Box. Hope you link up with us again this week! Beautiful and so very creative! I love the colors and it could definitely work for many occasions! Thanks for linking up with us at Home Matters linky party. We hope you will join us again at this Friday. Feel free to bring a friend!! Turned out beautiful! Thanks for linkin to Sunday FUNday!